Nagi’s breaking heart causes a pathway to the Royal Garden to open that is hundreds of times larger than expected. Athena orders monitoring inside the palace as Nagi comes in contact with the Book of Orumuzuto Nadja. Isumi requests Hayate stop Nagi as the book asks for Nagi’s wish. Nagi wishes for a world where Hayate loves her. With that, Nagi wakes in her ideal world where Hayate is her butler and loves her. Since Nagi is not on the monitors, Athena explains that Nagi is in a closed dream world. Hayate and Hisui are isolated and trapped in a dark space within the Garden Palace. Isumi’s great-grandmother Ginka slams some of her chains into the path to keep it open for a time. However, Himegami begins breaking the chains. Hina arrives and gets briefed about the situation. If Himegami succeeds, Nagi will remain in the dream world forever and Hayate will vanish. Mikado pleads with Himegami to stop. Himegami refuses, saying he’s aware of everything including the unrequited love. As such, it is his believe that Nagi being happy in her dream world is fine. Not only that, eventually Hisui will emerge victorious. Athena and Isumi get ready to maintain the path. However, as Himegami attempts to resume destroying the chains, Hina produces Shirozakura, the blade of which stops Himegami. Hina tells Athena to take care of the path as she will retrieve the stone that Himegami and Hisui brought. While the manga speeds rapidly to its conclusion, at lease we are looking to get some Hina action love. I read someone speculating (and forgive me for not remembering where I saw this) that a few chapters ago when we had a gag chapter showing Hayate having a vision of himself in the mansion with Maria and Nagi, Hayate was seeing an actual event. 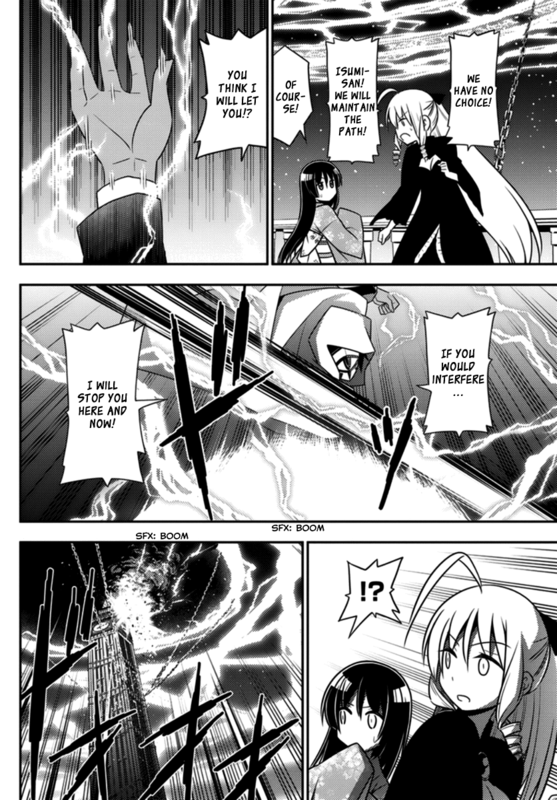 That may well be true, based on the events of Hayate the Combat Butler chapter 562. Nagi has created her fantasy world where Hayate loves her romantically. But even though that’s true, how would Hayate have seen this? I guess that chapter 549 could be part of Nagi’s fantasy. I suppose it could be Hayate’s fantasy where he maintains the status quo for life. I find it interesting that Himegami has kept such a close tab on Nagi since his departure. Hata-sensei may still have a surprise left in store for us regarding him. That said, I also find it interesting that Himegami is fine with Nagi being within a happy dream for eternity. While it doesn’t appear that Kurotsubaki will make an appearance in the manga (though there are still six chapters), Shirozakura (or Shirosakura if you like) does show up. I really had begun to wonder if Hina would show up to fight or not. With the manga rapidly moving to its conclusion, I could see Hina getting swept to the sideline. Thankfully, that’s not the case. But here’s the problem. Can Hina take on Himegami solo? Hayate couldn’t defeat Himegami, nor could Athena and Isumi. So unless Shirozakura has some power to aid Hina in her fight, I’m not sure how she will win. My brain has turned to mush, so let me wrap this up. Why was the Book of Orumuzuto Nadja waiting for Nagi? I’m guessing it has to do with Yukariko. It is kinda sad seeing how feckless Athena and Isumi are coming off. Always glad to see Ginka in action. 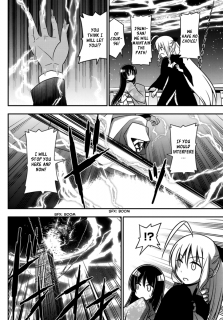 In the end, Hayate the Combat Butler chapter 562 is not a bad chapter. But things feel a bit off, possibly because the manga is speeding to its end. 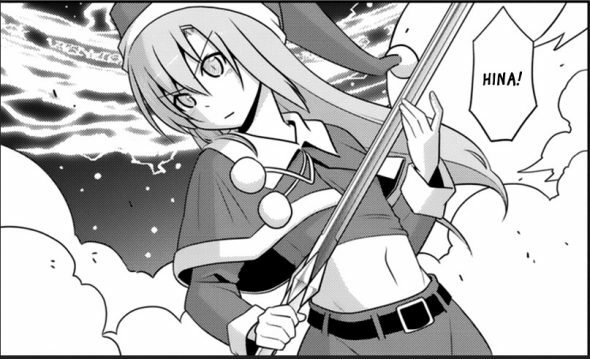 Hina fighting in a christmas/elf outfit, flying like a surfer on a sword. She looks good in it too! Too bad it’s b&w and not in color. A part of me wonders if her outfit red or green or both? 🙂 Being a ‘ally of justice’ its almost making Hina a superhero complete with costume. Hina fighting in a christmas/elf outfit, flying like a surfer on a sword. She looks good in it too!